Observers say Blaine Richardson, who surprised many with a strong 2012 showing as a relative unknown, has little chance of winning, but could alter the race. Belfast conservative Blaine Richardson said he left the Republican Party to run as an independent for Maine’s 2nd Congressional District seat, an announcement observers say could alter the race. Richardson made himself known in 2012, when he won more than a third of votes in the Republican primary for the same seat as an underfunded newcomer compared to his opponent, former Maine Senate President Kevin Raye of Perry, who won the nomination. Two Maine political scientists said that while Richardson has little chance of winning, he could negatively affect the Republican primary winner’s vote total, sentiments the candidate rejects. “We’re in it to win,” Richardson said. 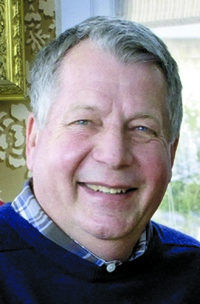 Richardson, 63, has a kept a high profile in Maine’s grassroots conservative community since his loss to Raye, who has also declared a run in 2014 for the congressional seat. Raye jumped in to the race after U.S. Rep. Mike Michaud, the six-term Democrat from East Millinocket who beat Raye in 2012, announced a run for governor. Matt McDonald, Richardson’s campaign manager, said the candidate will formally announce his affiliation change Monday morning on WVOM, a Bangor radio station. Richardson is a hard-line conservative, with limited-government principles. He wants the federal Affordable Care Act repealed, is anti-war and opposes what he sees as overbroad surveillance programs, such as practices that have been disclosed over the past months at the National Security Agency. Richardson has been active as a gun-rights advocate in Maine over the past year. For example, in testimony before a Maine legislative committee last year on a concealed-handgun permit issue, he testified that the constitutional right to a firearm is unlimited, and therefore, those permits are unconstitutional, a stance courts have long disagreed with. Richardson, a retired Navy captain, said the decision to leave his party was motivated by recent moves by national Republican figures that have upset him, particularly a recent budget compromise deal signed last month by President Obama that made an annual, one-percentage point cut in working-age military retirees’ future pension increases. Politically, the move to drop party affiliation makes his path to the November 2014 ballot easier, avoiding a primary with two well-known Republicans, Raye and Bruce Poliquin, the former state treasurer who lives in Oakland. Now, Richardson must gather 2,000 signatures from registered voters in the district by June 2, per state election rules. He would appear alongside whoever emerges from the party primaries. However, his campaign has little cash: From January 2013 through September, federal records show he had just over $3,000, compared to more than $90,000 for Raye and $220,000 for Poliquin. Richardson didn’t clear the primary hurdle against Raye in 2012, but had a good showing on a shoestring budget of just above $53,000, gaining more than 12,000 votes, or 34 percent, to nearly 19,000 votes for Raye, who got 51 percent. More than 5,000 ballots were left blank. Two Democratic state senators, Emily Cain of Orono and Troy Jackson, the senate majority leader from Allagash, have kicked off campaigns for their party’s nomination to the seat, as has newcomer Alden Smith of Sangerville. An independent running to the right of other candidates is rare in Maine, said James Melcher, a political science professor at the University of Maine at Farmington, who cited U.S. Sen. Angus King and gubernatorial candidate Eliot Cutler as prominent, left-of-center independents who have gained wide support here. While Melcher said Richardson’s facing an uphill battle to win, he has a motivated base and could take votes that would normally go to the Republican in a one-on-one race, which could be “quite significant” in a campaign projected to be close. Mark Brewer, a political science professor at the University of Maine, agreed, saying Richardson, given his primary showing, is likely capable of capturing a little more than 10 percent of votes in a general election, with little chance at winning. “The bigger his number is, the worse it is for the Republican, be it Raye or Poliquin or someone else,” Brewer said. But Richardson said he’s “acutely different” from other candidates, as a principled conservative who wants laws he sees as bad repealed and said he doesn’t want to compromise with lawmakers who he thinks overreach. “I’m done fixing stuff,” Richardson said. “It’s like herpes; it just keeps on giving.